The final Swarovski SCS crystal figurine in the “Caring and Sharing” series was the Swarovski ‘Amour’ Turtledoves. The Turtledoves figurine was a lovely cherished collectible illustrating the companionship between the two birds. 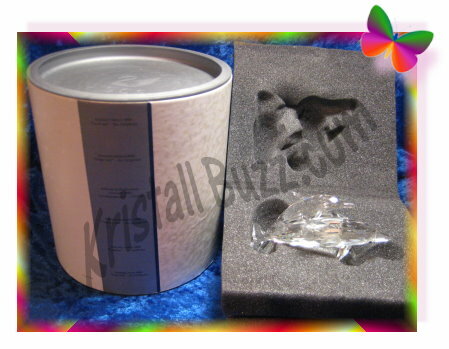 The Swarovski Turtledoves Box, or in this case, the Swarovski cylinder, is key to securely house the crystal figurine while it is not being displayed. The Amour Turtledoves container measures about 7 5/8” in height and 7 ¼” in diameter. The Swarovski Turtledoves cylinder is mostly white in color, with silver-gray end caps. 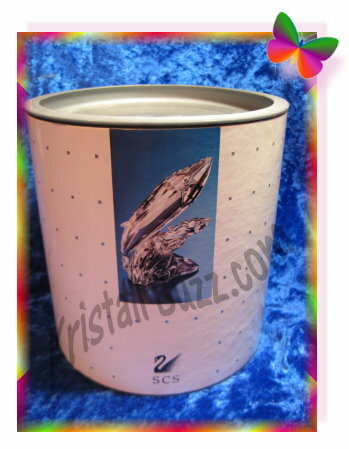 On the Turtledoves cylinder box, collectors can see ‘Annual Edition 1989 “Amour” – the Turtledoves’ in English and in 5 other languages in the grayish stripe on the cylinder. The Swarovski – assigned reference number can be found near the bottom edge in very small letters. The Swarovski Turtledoves Box reference number is DO3MM882. The Turtledoves Box can also be found using another reference # DO1X891B, which was firstly found in the Warner’s Blue Ribbon Books on Swarovski Catalogue. 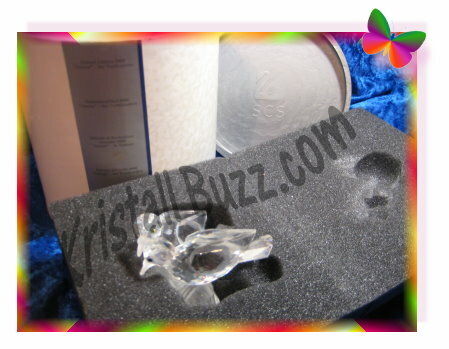 The foam was specially formed to securely transport and store the treasured SCS crystal figurine with its certificate. The Turtledoves foam contains a special slit for holding certificate. 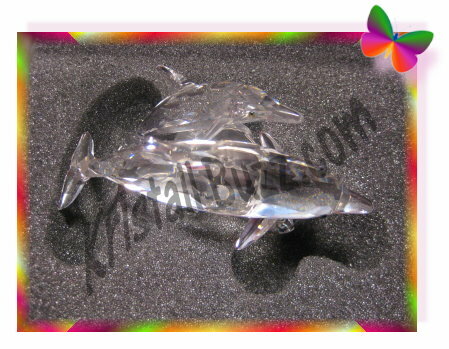 A special thanks to Swarovski expert Jane Warner, co-author to Warner’s Blue Ribbon Books on Swarovski for consulting on the Swarovski Dolphins Box article. 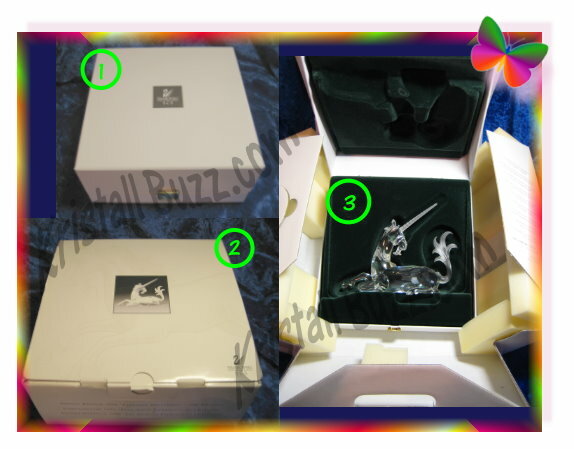 Regarding availability and replacement value, the Swarovski Turtledoves Box is not easily found at this point in time. The last one that sold was over 5 years ago, and those prices are too out of date to even mention. 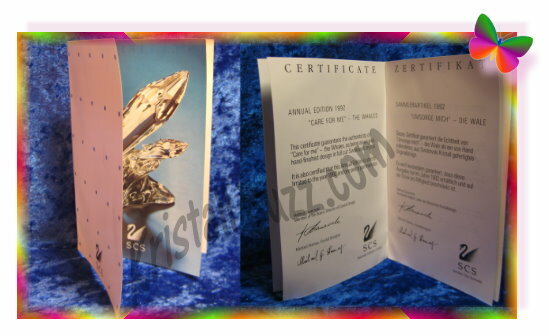 However, Crystal Exchange America does have listing for the box and certificate set that can be purchased for $375 if there is a true need for original packaging and documentation. The second Swarovski SCS crystal figurine in the Caring and Sharing trilogy was the Swarovski ‘Sharing’ Woodpeckers. These Swarovski Woodpeckers would have a special presentation and package that would be very similar to its predecessor, the Lovebirds. The SCS Woodpeckers had a custom box, which would be so unique, no other figurine would fit in it. 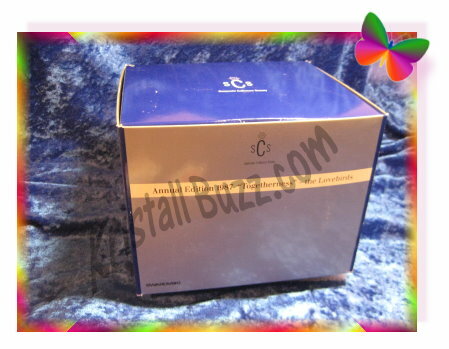 The box was primarily silver and royal blue in color. Since the SCS was growing its distribution channels, the packaging would also be available in other languages. The English Woodpeckers Box that we most frequently see in the USA features a blue top. 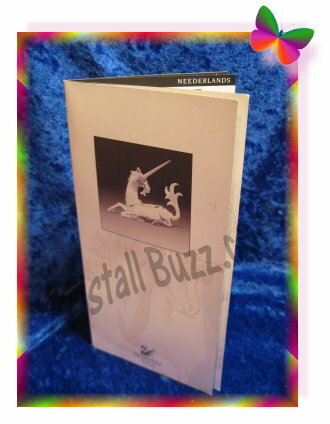 On all 4 sides, collectors can read the text ‘Annual Edition 1988 “Sharing” – the Woodpeckers. The Swarovski –assigned part numbers can be found on the rear side in a very small type. 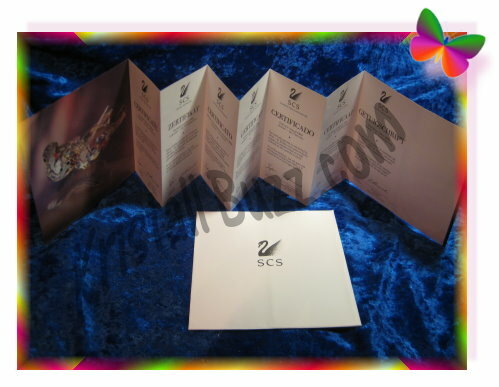 The English Swarovski Woodpeckers Box reference number is DO3E871. The multi-languange Swarovski Woodpeckers Box reference number is DO3M881. 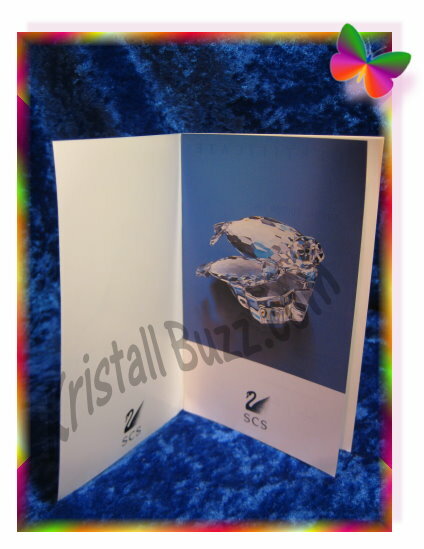 The Woodpeckers Box can also be found using another reference # DO1X881B (same reference number regardless of the language), which was originally used in the Warner’s Blue Ribbon Books on Swarovski Price Guide. 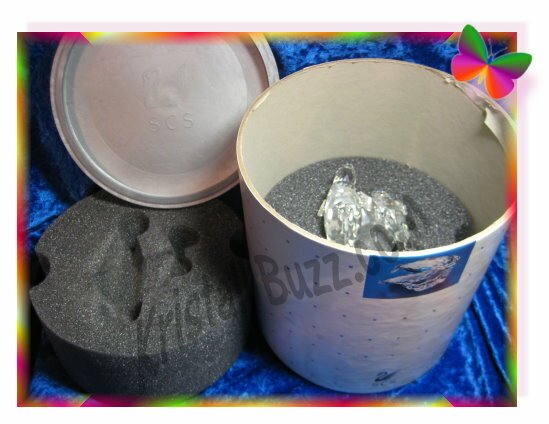 The foam was specially made to especially protect the SCS figurine. As can be seen in the image, the trunk rests in the largest indentation on the left side. The egg-shaped indentation on the right fits over the mother woodpecker wing and head. There is also a slot in the foam below from the crystal for the mirror. A special thanks to Jane Warner, co-author to Warner’s Blue Ribbon Books on Swarovski for consulting on the Swarovski Woodpeckers Box article. 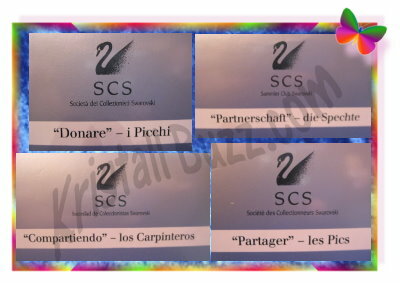 Regarding availability and replacement value, the SCS Swarovski Woodpeckers Box is becoming harder to find. One reason is that collectors simply did not keep the packaging. Even for collectors keep it, the Woodpeckers boxes was thin and would easily tear. 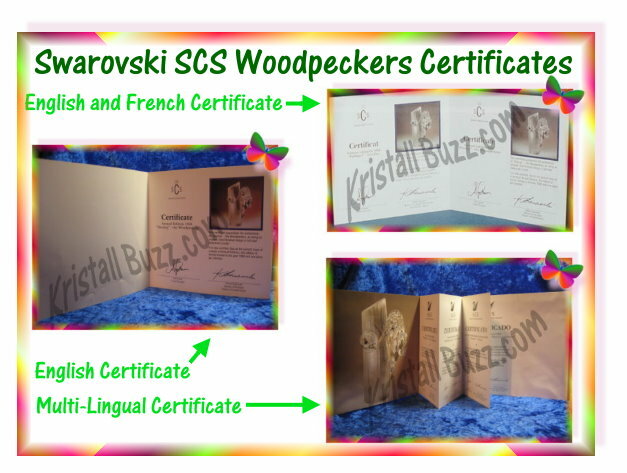 I did not find packaging boxes for the SCS Woodpeckers in the online auctions, nor at Crystal Exchange America. 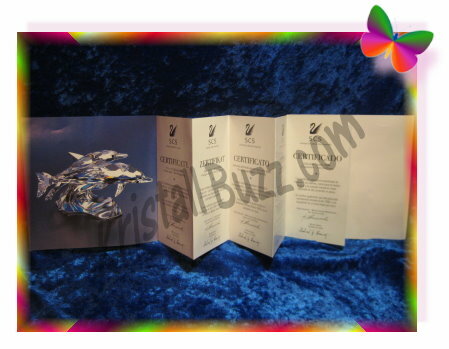 However, in their last completed transactions, Swarovski Woodpeckers Box in good condition sold in the range of $350 – $500!